It is no easy feat to hold the attention of an audience largely comprised of students for eighty minutes straight while alone on a stage with only a chair and a pile of sticks for company. Difficult, but not impossible, as shown by Ben Duke in the one-man show retelling of Paradise Lost by John Milton shown in the Nuffield Theatre on the 18th October. Paradise Lost itself is a retelling of what some would call the greatest story of all time, that of creation. Adapted from the book of Genesis from the Old Testament this epic poem tells the story of how the world came to be. To most undertaking a project like this would seem at the very least daunting but to take it on single-handedly seems almost daring. 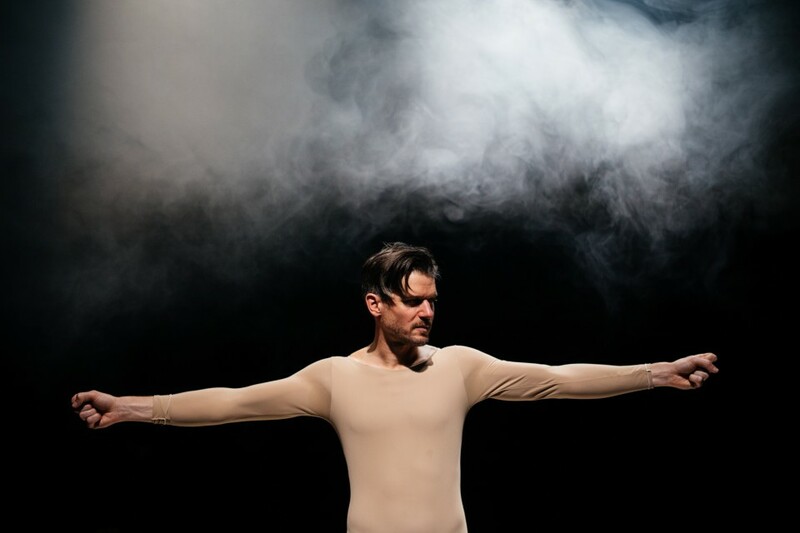 Or perhaps it is more apt to steal Duke’s words when opening the show and thanking the audience for coming to a contemporary dance one-man retelling of creation; “brave” he quips. The performance opens with Duke pulling a chair onto the stage and seating himself comfortably within a circular white sheet laid out on the stage, a set that makes it quickly apparent that this rendition of Paradise Lost will be exploring theatre in one of its barest forms. Religious fiction is certainly not the first genre most would think would be turned into comedy but Duke shows the versatility of his imagination by doing just that. A favourite moment for many was when a besotted God develops a crush on Lucifer (yes, really) and the narrator informs the audience with a straight face that, “he had Lucifer’s phone number.” There is a pause as the audience laughs allowing Duke to seemingly drop all personas and admit a little sheepishly that liberties had been taken with the text. This short scene alone shows Duke’s impressive conduct and control as he seamlessly blurred the lines between the candid words of actor, the storytelling of narrator and the performance of character all while saturating his performance with comedy. For as much as it is a one-man show on stage, it certainly isn’t the same story behind it, as light and set designer Jackie Shemesh along with artistic collaborator Raquel Meseguer helped to bring this piece to life. The bareness of the set and the minimal use of props only served to enhance the performance by ensuring that Duke himself was all there was to hold the audience’s attention. At one point three small spotlights are directed at Duke splitting his shadow into three on the theatre walls behind him, physically showing the split of himself into the different personas he is portraying. For being a contemporary dance performance there was surprisingly little dance involved. When he does dance however Duke’s training is clear in the way he contorts and moves beautifully in the dances of creation and how he crashes and writhes in dances of battle. His voice adds to the movements as he communicates what his body can’t in creating crashes, wind, thunder and the noise of horses cantering. The comedic intelligence of this piece is what allows the audience a mental break from what is always underlying the performance, a serious piece of theatre that is based on being human and the world of parenting. The closing scenes of the performance feature Duke sat unbothered beneath a cascade of water, but instead of a light-hearted quip about the gel melting off of his hair, instead what follows is a truly powerful performance about the harrowing events of the Bible. Eventually the sounds of Glory Glory Hallelujah ring out clearly throughout the otherwise silent theatre and Duke’s frame slumps down in defeat; the audience no longer even sure who he is anymore as he simply becomes a representation of all people, of the core of humanity. Never before has a man moving slowly and unsteadily around a single chair without uttering a word had such a profound meaning. One of the best ways that this performance can be described is in the reactions of its audience. After filing out of the theatre the foyer was filled with the voices of many students all expressing their thoughts. “I didn’t know what to expect but it wasn’t that,” one says. More voices join in, “it was surprising, in a good way,” and, “unpredictable.” However my favourite overheard opinion after having sat still for over an hour to watch the performance was, “I’m still processing. I need to sit down.” That in itself is what makes this performance so enrapturing; it makes you think, as all good theatre should.